Chronic muscle pain and soreness can develop from exercise, poor posture, or overworking the muscles on a daily basis.It is very common to develop sore neck, back, and shoulder muscles with everyday activities around the house and repetitive work postures. Many people think they need strenuous exercise to damage muscle fibers, however most cases of muscle pain are due to chronic postures, habits, and activities throughout our typical day. Muscles also need to contract during the day to maintain our postures. Muscle is slightly contracted to maintain muscle tone, which helps hold up our neck, shoulders, and spine for us to sit or stand. These muscles are contracting throughout the entire day to maintain our posture and balance. We never think of these muscles working while sitting on the couch, but muscles are always contracting on some level. With slouching we make the postural muscles work harder than necessary, creating small amounts of fiber damage every day. The level of muscle fiber damage is less than lifting weights, but it accumulates over years. As you may have noticed, muscle soreness and pain increases with poor posture and slouching. While light exercise, stretching, better posture, and rest help relieve the neck pain and muscle soreness, small improvements in posture significantly reduce strain on neck muscles and joints. Often times chronic muscle soreness is associated with muscle spasms and tightening. Stretching tight neck and back muscles along with exercise helps improve muscle flexibility. Specific neck exercises and back exercises specifically target the injured muscles. Chronically sore muscles often develop scar tissue or fascial adhesions within the muscle fibers. Scar tissue alters how muscle fibers can slide and move past each other. This changes the overall function of muscles and leads to additional muscle injuries. Multiple treatments can be provided to help break up the scar tissue and fascial adhesions. 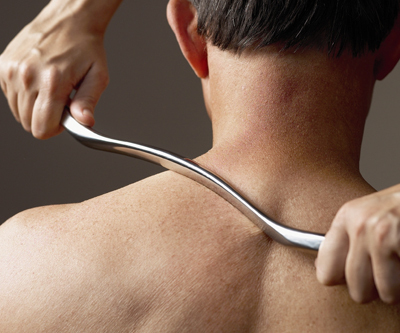 Massage therapy is an excellent treatment for chronically tight neck, back, shoulder, arm, and leg muscles. 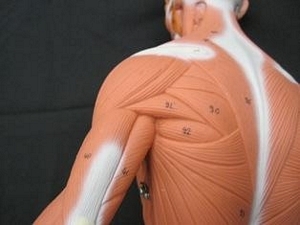 the trained massage therapists can utilize different techniques to break up the scar tissue between muscle bundles. many people who have had massage therapy in the past often feel these knots in their neck and back muscles. these knots are often the first place they begin to feel neck and back pain and are actually collections of scar tissue and fascial adhesions in the muscles. breaking up these knots helps reduce pain and injuries. Graston technique, ASTYM, and active release technique are more advanced treatments for specifically breaking up scar tissue and fascial adhesions between muscle fibers. These techniques are better at breaking up scar tissue between the individual muscle fibers, whereas massage therapy is better at breaking up scar tissue between large muscle groups. Graston technique and ASTYM utilize specific instruments designed to break up the scar tissue. A trained provider complements Graston Technique with stretching, exercises, and additional treatments to break up scar tissue and enhance normal healing and repair. These treatments are exceptionally effective when people have a history of chronic muscle pain. Especially when they describe knots in muscles that are usually the first source of pain they feel with poor posture or activity. These knots often lead to headaches in the neck and upper back. In the low back people describe pain that always begins in one spot that eventually tightens up the rest of the low back. Athletes often have scar tissue in shoulders, elbows, and leg muscles that respond very well to these treatments. People who develop chronic tendinitis and muscle soreness often have significant amounts of scar tissue that contribute to their chronic pain. Muscle fiber should slide back and forth past each other. When scar tissue or muscle adhesions develop between the fibers, it prevents normal motions and movements. The accumulation of scar tissue over time leads to chronic muscle pain and injuries throughout our muscles. Specific treatments can be performed at home to decrease muscle pain and soreness, in addition to enhancing flexibility and strength. Individuals suffering with chronic muscle pain and soreness may benefit from more advanced treatments that help break up the scar tissue, including Graston or massage therapy. Muscles are designed to move and slide past each other to aid us in our daily functions and movements. Scar tissue limits these movements and results in a chain reaction producing scar tissue in compensating muscles. Over time, this accumulation of scar tissue develops chronic knots and soreness that lead to pain. Treatments that break up the scar tissue enhance healing and recovery, reducing overall pain levels and improving function.